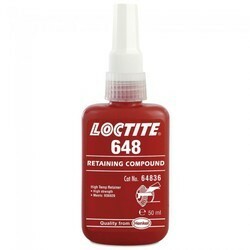 Wholesale Distributor of a wide range of products which include retaining 641 sealant adhesive, retaining compound 648 adhesive, 660 quick metal sealant adhesive, retaining 609 anaerobic adhesive and retaining compound 638 adhesive. We are one of the leading and renowned names, engaged in sourcing and supplying superior range of Retaining 641 SealantAdhesive. Formulated using optimum grade ingredients, these sealants are suitable for parts that need subsequent dismantling, i.e. retention of bearings onto shafts and into housings. 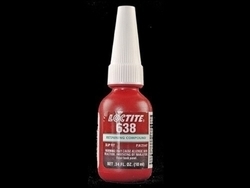 These medium strength Loctite 641 sealant is offered at most competitive prices to our valued clients. Data sheets Manual Dispensing Retaining Calculation. Fixture time on steel: 25 min. 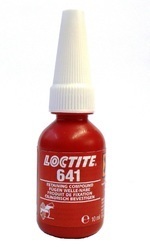 We hold expertise in offering a broad spectrum of Retaining Compound 648Adhesive, which is formulated in adherence to industry laid standards and guidelines. Made using accurate composition of effective compounds, this high strength retaining sealant is widely used in applications such as holding gears and sprockets onto gearbox shafts and rotors on electric motor shafts. Carefully procured from our business associates, these are safely stored and cross examined at our premises so as to leave no scope for even minute defect in the range. We are recognized in the industry for availing optimum quality 660 Quick Metal Sealant Adhesive, which is formulated by one of the prominent names of the domain, Henkel. 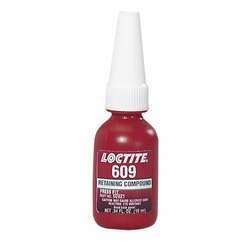 A creamy, non-running adhesive/sealant, this Top Pick Loctite® 660™ Quick Metal® Retaining Compound is widely used for repairing worn coaxial parts without re-machining. Formulated under controlled condition using accurate composition of quality compounds, these sealants makes the worn bearing seats, keys, splines, tapers reusable or for retaining shims. 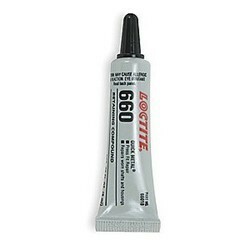 The range of Retaining 609 Anaerobic Adhesive offered by us is specifically sourced from the leading brand of the market. Formulated using pure compounds, these sealants are known to augments the strength of press fit assemblies or slip fit assemblies up to 0.005"in diameter. Carefully stored and packed by our professionals, this low viscosity, rapid-curing anaerobic adhesive have the ability to add up to 3,000 psi holding power to the part. Retaining Compound 638Adhesive is a maximum strength retaining compound for use where high dynamic force or cyclic loading is expected. Locks cylindrical assemblies up to 0.010" diametral clearance. Fixtures in 5 minutes. Looking for Retaining Adhesive ?